For you to learn how to make waffles you will need to get a waffle iron. This iron or “baker” is available in many sizes and shapes. It depends on how much you plan on using it just how much money you will want to spend on this item. Mine was not expensive and has lasted a long time. I always recommend yard sales and used stores for items like this. When cooks grow older they often discard many of their appliances so great buys can be found for special items. The history of waffle making can be traced back to the eighteenth century to the Belgium area. If you like pancakes (hotcakes, etc. ), you will like waffles. I like waffles much more than pancakes. The waffle iron will have a top and bottom hinged together on one side. By lifting the top open you can spoon batter over the bottom after heating. Close the lid over the batter and cook. The more modern waffle irons usually have a light which tells you when the waffle is done. You will not want to open the lid until the waffle is done fearing the design might be messed up. After closing the lid you will soon notice steam rising out of the iron from cooking the dough. If your iron does not have a light, cook until the steam stops before opening. The design in the waffle iron, when heated until hot, gives the batter a delicate crispness. This texture is not obtainable without the waffle iron. Irons are available to make waffles in different sizes and shapes. If you are learning how to make waffles and have children, at Disneyland you can buy the irons in a shape of Mickey Mouse. If I want to make waffles to freeze I like the smaller square waffle iron so I can put them in the toaster for quick “fixing”. My favorite is the Belgium waffle. It is thicker with deeper groves making a beautiful presentation. These are served for breakfast, brunch or anytime and also make a great dessert with fruit and whipped cream. When learning how to make waffles, using the iron is pretty simple. The one tip I have is to brush the hot iron with cooking oil for each waffle. Use iron even if your iron is “no stick”. The oil serves two purposes; makes perfect shape and helps with a crispy texture. When you are finished with all the cooking, let the waffle iron cool. Using a damp cloth wipe the waffle iron down thoroughly and then dry with a clean cloth before storage. Learn how to make waffles using a basic recipe with options to make different flavors. Combine eggs, milk and melted shortening in mixing bowl; mix well. Sift flour, baking powder and salt together; add to egg mixture. Beat batter until well blended; pour batter into waffle iron and close lid. Bake waffle according to manufacturer directions; serve with butter and syrup. Servings: Depends on size of waffles; 6 average. 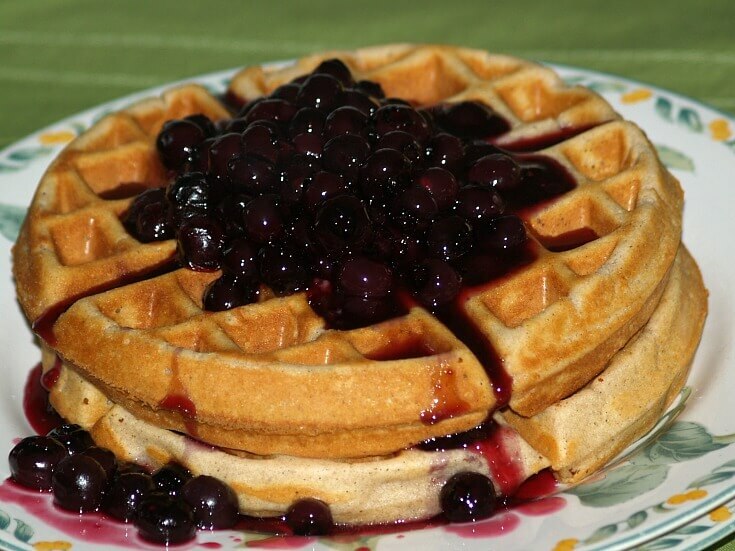 To make FRUIT WAFFLES add 2 tablespoons sugar, ¾ cup sliced bananas or ¾ cup fresh or drained canned fruit. To make NUT WAFFLES add 2 tablespoons sugar and ½ cup chopped nuts. To make SPICED WAFFLES add 2 tablespoons sugar, ½ teaspoon cinnamon and ½ teaspoon nutmeg. To make CHEESE WAFFLES add ½ cup grated cheese to the batter. Learn how to make waffles with this crispy flavorful hominy recipe. Stir shortening into hot hominy; add liquids. Add flour, baking powder, salt and sugar; mix well. Pour batter into hot oiled waffle iron; cook until browned. Learn how to make waffles with crushed strawberries. Beat egg whites until stiff peaks; set aside. Beat egg yolks separately; set aside. Add egg yolks, milk and shortening to dry ingredients; blend until smooth. Blend in ¾ cup of the strawberries; fold in beaten egg whites. Bake in hot oiled waffle iron; serve with butter, syrup and remaining strawberries. Learn how to make waffles with cornmeal. Combine cornmeal and boiling water; let stand. Sift together flour, soda, sugar and salt in mixing bowl. Add cornmeal mix, egg and oil to dry ingredients to dry ingredients; mix well. Pour into hot oiled waffle iron; bake until browned. Learn how to make waffles with one of my favorite ingredients; sour cream. Beat egg yolks; set aside. Combine all dry ingredients in mixing bowl; stir to blend. Stir sour cream and egg yolks into dry ingredients. Add milk and oil beating until well blended; fold in beaten egg whites. Bake in hot oiled waffle iron; brush with butter. Learn how to make waffles with cooked wild rice. Beat egg whites with mixer on high speed until stiff peaks form; set aside. Beat egg yolks in mixing bowl with wire whisk. Stir in milk, flour, baking powder, salt and melted butter until smooth. Add wild rice; fold in beaten egg whites. Spoon batter into hot waffle iron; bake until browned. Serve with maple syrup; serves 4. Learn how to make waffles with this healthy oatmeal recipe. Combine whole wheat flour, baking powder and salt in mixing bowl. Add to bowl the milk, egg vegetable oil and honey. Beat mixture on medium speed of mixer until well blended. Spray waffle iron with oil; preheat. Spoon batter into hot waffle iron spreading to the edges. Note: 1/3 Cup batter for average size waffle. Close lid and bake about 5 minutes or until steams stops coming out. 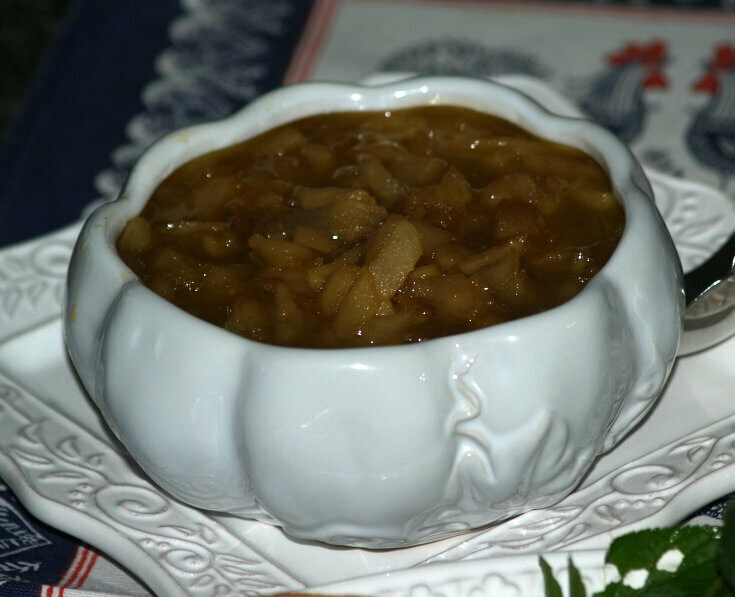 Serve with apple topping (Recipe below); makes 12 waffles (4 inch size). 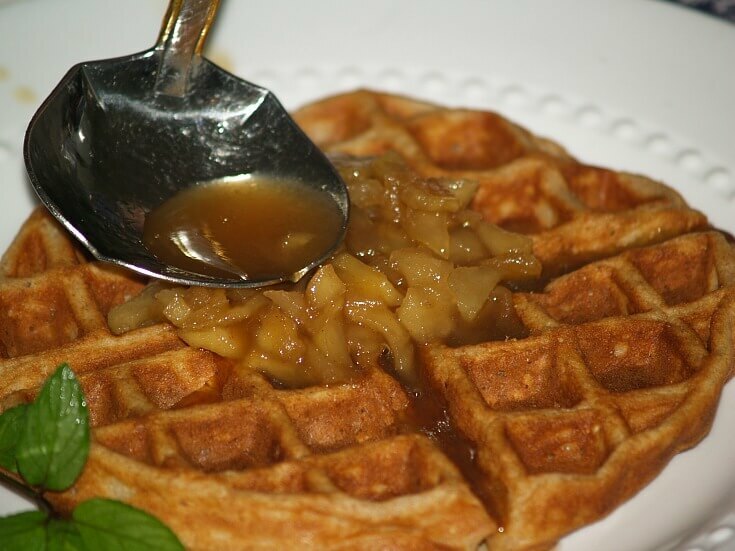 When you learn how to make waffles you with love this delicious apple topping. Cook until hot and bubbly stirring occasionally. Learn how to make waffles pleasing to everyone. Combine ¼ cup of the flour with the raisins; chop raisins (Flour makes it easier). Sift remaining 1 ¼ cups flour, baking powder, salt, cinnamon and sugar in bowl. Add milk, beaten egg yolks and butter to dry ingredients beating until smooth. Stir in the chopped raisins; bake in hot oiled waffle iron until golden brown. Serve with syrup; serves 6. When I learned how to make waffles and pancakes I loved using buttermilk in them. Sift together in mixing bowl the flour, soda, salt and baking powder. Add beaten eggs and small portion of buttermilk; blend well. Add enough of the remaining buttermilk to make a pourable batter. Stir in the cooking oil; pour batter onto hot waffle iron and cook. Makes about 4 regular waffles. 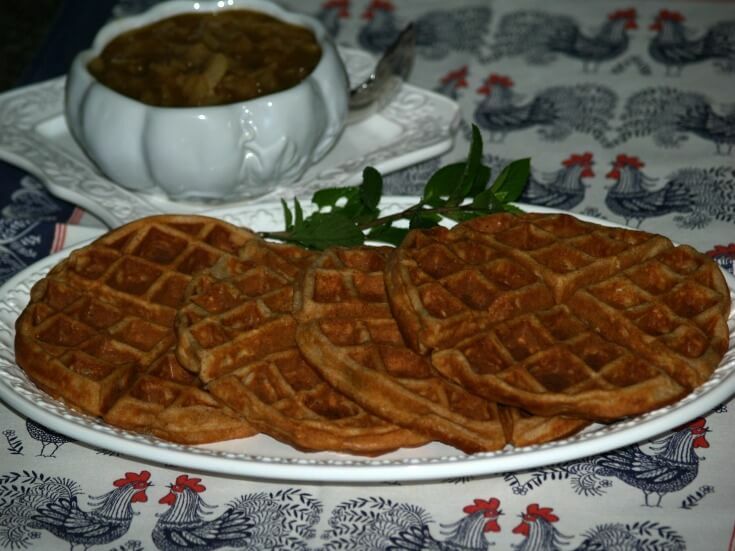 Learn how to make waffles with the delicious flavor and moistness of sweet potatoes. Sift together in mixing bowl the flour, baking powder, sugar, salt and nutmeg. In another bowl combine eggs, shortening, potatoes and milk; mix well. Add egg mixture to dry ingredients stirring until well blended. Bake in heated waffle iron until browned. Learn how to make waffles flavored with orange. Sift together in mixing bowl the flour, baking powder, sugar and salt. In another bowl combine the eggs, melted butter, milk and orange rind. Add egg mixture to the dry ingredients beating until batter is smooth. Pour batter into heated waffle iron; bake until golden brown; serves 8. Learn how to make waffles; a favorite recipe for many. Sift together both flours, sugar, baking powder, soda and salt; resift. In another bowl blend together the egg yolks, buttermilk and melted butter. Light blend together egg mixture with dry ingredients. Beat egg whites until stiff peaks form; fold whites and chocolate chips into batter. Bake in hot oiled waffle iron until golden brown; serves 6.